Whoops! Maybe you were looking for Jesus Christ? 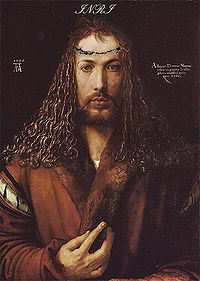 Albrecht Durer (May 21, 1471 – April 6, 1528) was a Renaissance painter, printmaker and self-declared Second Coming of Christ. Born in Nuremberg, Germany, he made it his mission, throughout his career, to convince the German people of his divine superiority through his chosen medium, the pictorial arts. Unfortunately, noone has actually heard of him aside from the most ardent of arts' afficianados, but they assured us of this, just as they assure us that his mastery of draughtsmanship is "beyond perfection, my dear" and say his contributions to the naturalistic style - employing a "quite exquisite" earthy pallette - are second only to Leonardo da Vinci to none. When asked specifically about his works, academic types generally maintain that he is best known for his series of self-portraits - both engraved and painted - in which he bears an uncanny (but quite deliberate) resemblance to Jesus Christ ("but far more handsome..."), a series of naturalistic sketches made while travelling in the Netherlands and a number of later religious devotional works ("devoted to himself, of course - and quite rightly so!"). I will now recount the artist's life, with assistance on technical and aesthetic matters coming from the esteemed Professor Stefan Knapp from Vienna's Kunsthistorisches Museum. 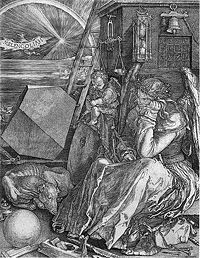 Supposedly born of a virgin birth in his native Germany, the young Durer was massively obsessed with his greatness from day one. While on vacation in Flanders in 1479, his father - a successful goldsmith with strong links to Flemish arts circles - took him to see the works of the Flemish master Jan van Eyck. It was upon viewing of a particularly ground-breaking "Madonna and Child", that Young Albrecht decided he knew what he wanted to do with his life. He was captivated and awe-inspired by the majestic work, he had seen something in the picture that no art afficianado before him had seen - how much the baby looked like him! Upon his return from Italy, Durer painted another couple of self-portraits before marrying Agnes and opening up his first workshop (marriage, interestingly, was a prerequisite for this). According to his wife's diary, Albrecht spent most of his days with "his bunnies", sketching them over and over again. Showing concern that he was spending the majority of his time with the tiny mammals, grooming, posing and sketching them, Agnes suggested he turn his attention elsewhere. So he did, and the world was graced by a further four self-portraits, a series of charcoal studies dedicated to the perfection of the artist's nose, and an (ultimately rejected) altarpiece for Aachen Cathedral in which the similarity of appearance between Albrecht and the subject was no longer subtle by any stretch of the imagination. Durer's second brush with Greatness (and no, I don't mean that laudanum fiend Hieronymus Bosch), came just before his 30th birthday. By this time, Durer's reputation as an animal portrait artist had grown to the point that royalty from throughout Europe were commissioning him portraits of their kittens, rhinos and stick insects, and the artist's living had become reasonably comfortable. His most consistent patron was the then Holy Roman Emperor, Maximilian I, who funded numerous projects for Durer and provided him with lodgings in a building large enough that he could avoid all contact with Agnes, sometimes for weeks on end. Here Durer painted Maximilian, Maximilian's horse, Maximilian beside Maximilian's horse, Maximilian riding Maximilian's horse, and Maximilian riding Maximilian's horse. Though the veracity of the latter cannot be determined, Maximilian was a Hapsburg after all, so it's really not too far fetched. Durer's sight being set on wrestling the reputation of the era away from his affeminate contemporaries, he immediately locked himself away in his studio to devote his time solely to this most precious of tasks. Durer never came to terms with the fact that everyone had heard of Da Vinci, but everyone had seemingly forgotten about him. 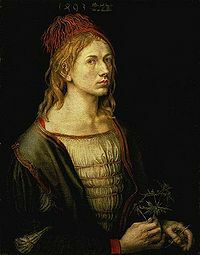 Unlike other Northern European artists of the period, who were quite content just painting triptychs for altarpieces or getting stoned out of their mind and painting triptychs for altarpieces, Durer choose to demonstrate his genius by mastering every type of artistic endeavour know to man. Durer painted anything and everything. Just to prove he could. A rhinoceros! How exotic! Leo never painted one of these did he? HA! Amateur! Painted around the time of his first visions, Durer made sketch-after-sketch of this grass, usually gawping in awe and wonder. Durer's flattering depiction of his beloved mother (possibly proof the virgin claims were true). 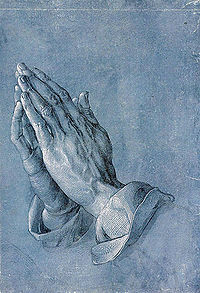 Durer was a keen supporter of the Lutheran movement until he realised the focus of worship was still the same boring Jesus. Durer's death and burial, as he wished it to be. This page was last edited on 20 September 2011, at 23:10.